Did dinos evolve flight twice? Photo of reconstructed skeleton of Buitreraptor gonzalezorum. Long hindlimbs indicate it was a fast runner. Elongated arms and massive shoulder girdle indicate powerful prey-grasping abilities. Paleontologists led by dinosaur curator Peter Makovichy of Chicago's Field Museum found the nearly complete skeleton of a 90 million-year-old, surprisingly bird-like dinosaur in the sandstone of Argentina's northern Patagonia, about 700 miles southwest of Buenos Aires. The find suggests that dinosaur flight in evolved twice – once in bird ancestors, and again in prehistoric raptors of South America. The fossil was the size of a very large rooster, with a very long head and tail, and represents the most complete carnivorous small dinosaur found in South America to date. 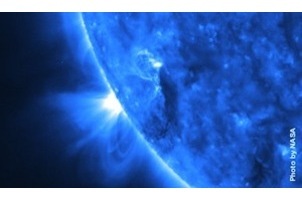 More from physorg.com.